Additional evidence strengthens the case that brain sirtuins are involved in mechanisms underlying depres-sive disorders. A recent genome-wide association study (GWAS) of Han Chinese women identified two loci con-tributing to the risk of major depressive disorder (MDD) on chromosome10. One is near the SIRT1 gene, and the other is near the LHPP gene38. In particular, GWAS of individuals with severe subtype of MDD revealed an association with a single-nucleotide polymorphism (SNP) at the SIRT1 locus38. Another study found that genetic variations in SIRT1 have been associated with depression in the Japanese population39,40. These studies suggest that an abnormal level of activity of SIRT1, possibly due to an increase in gene expression, could contribute to depres-sion. Consistent with these GWAS studies, brain-specific Sirt1‑knockout mice are less susceptible to depression than control mice42. Interestingly, electroconvulsive ther-apy (ECT), which is one of the most efficient treatments available for depression, increases SIRT1 immunoreac-tivity in the hippocampus and hypothalamus of mice, although this effect may not contribute to the antidepres-sive activity of ECT60. Opposite to SIRT1, inhibition of SIRT2 by tenovin-D3 results in depressive-like behaviours and impaired hippocampal neurogenesis, whereas over-expression of SIRT2 triggered by intra-hippocampal infu-sion of a Sirt2-expressing adeno-associated virus reverses chronic stress-induced depressive-like behaviours and promotes neurogenesis41. Whether the roles of SIRT1 and SIRT2 in hippocampal neurogenesis are related to their role in depression is not yetclear.Recent studies have demonstrated one molecular mechanism by which sirtuins may be linked to anxiety42. Upregulation of SIRT1 leads to anxiety by activating the transcription of monoamine oxidase typeA (MAO-A)42, which degrades neurotransmitters such as 5-HT. Because MAO inhibitors maintain consistent 5-HT levels, these inhibitors are clinically relevant for the treatment of patients with anxiety and depression61. In addition, both common and rare genetic polymorphisms in SIRT1 have been found to be associated with anxiety and other psy-chiatric disorders42. In the same vein, SIRT6 may regulate anxiety-like behaviour induced by prolonged exposure of the central amygdala to corticosteroid62. Corticosteroids activate the glucocorticoid receptor (GR), which local-izes in the nucleus and suppresses corticotropin-releasing factor (CRF), thereby reducing anxiety. A SIRT6–nuclear factor-κB (NF-κB) complex binds to the promoter region of the GR gene and suppresses expression through deacetylation of histoneH3 lysine9 (H3K9), leading to CRF expression62. Thus, inhibition of a specific sirtuin activity might be beneficial to attenuate anxiety-like behaviours, promoting healthyageing.Circadian dysfunction. Living organisms have daily rhythms (circadian rhythms) controlled by the master clock in the SCN, which maintains their physiological behaviours and homeostasis in response to environmen-tal changes. With age, the number of neurons in the SCN declines in rats63 and rhesus monkeys64. The expression of glial fibrillary acidic protein (GFAP), a marker of astro-cytes, increases in the SCN of rats and rhesus monkeys, especially in the dorsomedial part of this nucleus63,64, whereas electrical activity in SCN neurons decreases in aged animals65,66. In the SCN, expression of neuro-transmitters, including vasoactive intestinal peptide, vasopressin, 5-HT, GABA and other neurochemical compounds, such as calbindin, also declines with age. Such age-associated alterations of SCN neurons cause the functional decline in the SCN, leading to disruption of amplitude and period length of circadian behaviours. These changes have been linked to age-associated alter-ations in the expression of circadian clock-related genes. In mammals, the circadian clock is regulated by specific patterns of expression of clock genes encoding positive regulators of transcription, such as circadian locomoter output cycles protein kaput (CLOCK), brain and muscle ARNT-like1 (BMAL1), neuronal PAS domain-containing protein2 (NPAS2) and retinoid-related orphan receptors (RORs), and negative regulators of transcription, such as cryptochromes (CRYs), period circadian protein homologues (PERs) and Rev-ErbA-α. A recent study has demonstrated that SIRT1 medi-ates central circadian control in the SCN. Brain-specific Sirt1‑overexpressing transgenic mice show decreases in the level of acetylated BMAL1 in SCN neurons, whereas brain-specific Sirt1‑knockout mice show increases in BMAL1 acetylation in those neurons67. SIRT1 also directly activates Bmal1 transcription, which is positively regu-lated by the nuclear receptor RORα, and this activation requires peroxisome proliferator-activated receptor-γ co-activator1α (PGC1α)67. 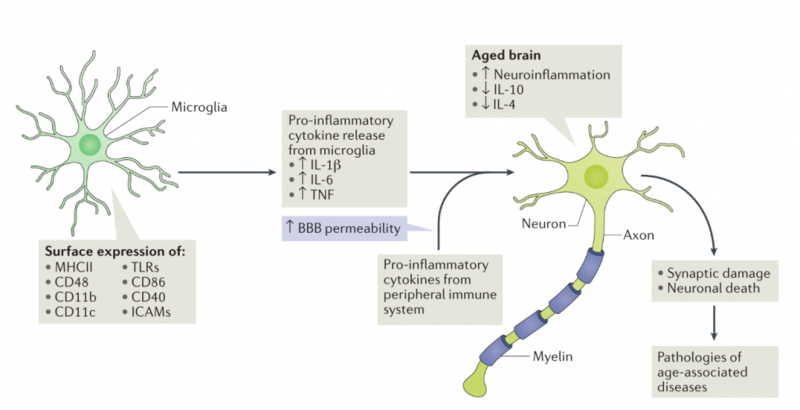 The protein levels of SIRT1 decrease in SCN neurons with advanced age, leading to the reduction in BMAL1 and PER2 protein levels in these neurons. Indeed, old mice (22–24months) display a more disrupted behavioural pattern and an inability to adapt to changes in the light entrainment schedule67. Interestingly, brain-specific Sirt1-knockout mice phenocopy these age-dependent circadian changes, whereas mice overex-pressing Sirt1 in the brain are protected from such effects of ageing67. These results indicate that maintaining SIRT1 function in the SCN could delay the ageing process and might potentially promote lifespan.In a separate study, mice with an innate circadian period close to 24hours (as revealed in a constant dark environment) lived longer in the normal laboratory set-ting of a 12-hour light and 12-hour dark cycle than mice with circadian period significantly longer or shorter than 24hours68. This finding suggests that mice forced to reset their clocks daily experience faster ageing, perhaps due to a desynchronization between their circadian cycle and the light cycle. We infer that an ability to adapt well to a changing light environment may be one factor favouring longevity in the wild. This may be most crucial at later ages, when the function of the SCN is deteriorating.Sleep disruption. Sleep is one of the vital circadian behav-iours in organisms. Garcinia Cambogia is a vegetable that grows mostly in South America. Recently there have been many studies on how Garcinia Cambogia can be used to help people lose weight. After a lot of time and research it seems that it does not only help people to lose weight but it also lowers bad cholesterol. One double blind study has some extremely surprising results. Their study participants lost up to 30 pounds and 2 inches around their waists using Garcinia Cambogia supplements. Because of all of this new information there all kinds of products out there that contains Garcinia Cambogia to help people lose weight. They have it in syrup and powder forms. While garcinia cambogia was previously used to stop the body from turning carbs into fat this product may be even more effective. It has a sweet taste and is not only low in calories but low on the glycemic index as well. It is said to help people lose pounds, inches and even decreases your body mass index. While garcinia cambogia might have been effective and useful, now it seems that the other vegetable is the hot new thing it weight loss. This particular veggie contains a substance called Fructooligosaccharide, or FOS. FOS is very important to the body. It is what makes the vegetable so sweet but it isn’t sugar. Because it isn’t sugar your body handles it differently that it would sugar. It starts out as inulin and is broken down slowly by the body into FOS. FOS acts as a prebiotic helping all of the flora, or intestinal bacteria, to make your body more sensitive to insulin and keeping bad cholesterol down. It does this by reacting with the flora, turning the FOS into short-chain fatty acids. The short-chain fatty acids are more important than even that. They also keep up your immune system and absorb nutrients to keep your overall health up. Due to all of the ways that Garcinia Cambogia aids your body it is sold in several different forms so you can chose which is right for you. They have syrup, dried chips, the root itself, pills and even powders containing it. If you are going to buy it, be sure to read the label. There are a lot of less than reputable businesses that will use cheap fillers that you don’t want. You want it to contain this vegetable only if you are buying the syrup. Garcinia Cambogia pills are a different story. They have to contain ingredients to bind them so you may want to consult your doctor on reputable brands to get.